What is Learning Curve in Apparel Manufacturing? In the apparel manufacturing industry, a learning curve is made for the sewing operators' performance learning curve. A learning curve of an operator is the performance growth of getting experience (time per unit) in a task. The learning curve can be drawn time per unit against cumulative repetitions or efficiency at work against cumulative repetitions. When a new style is loaded to a line, sewing operators (machinists) take time to reach their maximum speed (or normal speed). A sewing operator takes higher time to stitch a garment when she starts working on a new style. After doing the same task for many times, the time taken to stitch the garment or an operation is reduced. It may be due to new operation (job), a different machine with different settings and guide or a different kind material need to handle. Individual operators learning curve is normally prepared at the operator training stage. But you can even prepare learning curve for each and every sewing operator working in the production line. I have seen some factories prepare all operators learning curve. Normally a learning curve is prepared for the production line. This is easier to develop Line wise learning curve when you don't have individual employee efficiency data. See the learning curve of a typical production and typical garment style. In case you have short and long run orders, develop different learning curves for different order volumes. The reason, for short-run orders, you may not reach to line's pick efficiency level within the time production is over. Following are few reasons, a learning curve is made by industrial engineers. 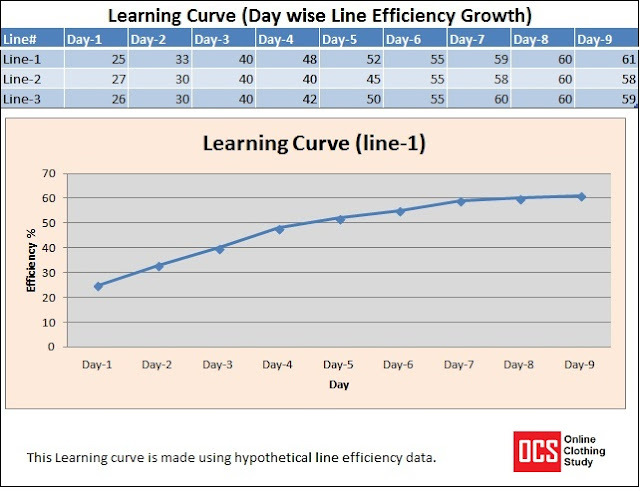 Industrial engineers use learning curve data to calculate daily production target in the initial production days of the new style. In production planning and target setting, the learning curve is used to plan day wise production target. A learning curve is also used to derive lead time of an order. For the incentive calculation in the learning period, the learning curve is used. If you have incentive scheme and you want to give incentive to your workers based on their efficiency level, learning curve helps to design target efficiency (eligibility level to earn incentive) for the initial days. In the next post, I will share how to develop a learning curve for your production line. Keep reading and keep sharing the knowledge. Online Clothing Study: What is Learning Curve in Apparel Manufacturing? Do you have a learning curve for your production line? Read what is a learning curve and why you need a learning curve.